1. 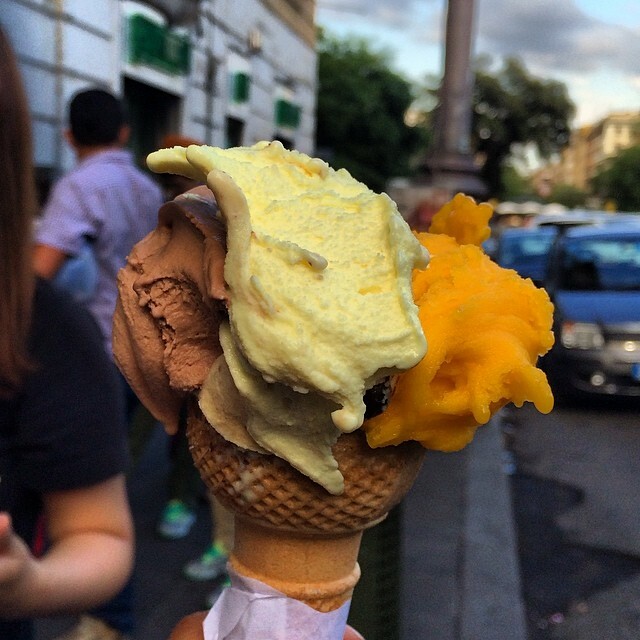 Because the gelato at Giolitti will make you forget what ice cream even is. 2. The same goes for the sweet stuff at Gelateria Del Teatro. 3. And also Gelateria Oldbridge. 4. Because it’s pretty awesome visiting a different country in your own city, aka the Vatican. 5. Especially when it’s lit up at night. 6. Or making the climb to experience the view at the top of St. Peter’s Basilica. 7. And catching even the smallest of glimpses of the Pope is a life-changing experience. 9. … or Da Baffetto, aka the pizza of your dreams. 10. Because no American sporting event could compare to a match at Stadio Olimpico, where you cheer on A.S. Roma. 11. ESPECIALLY when they’re playing their derby against arch rival Lazio. 12. Because eating “healthy” is never more fun than when you’re eating Carciofi alla Giudea, aka fried artichoke. Trattoria Dell'Arte: Roman Fried Artichokes Alla Giudea. 14. … is stepping inside and imagining a gladiatorial match from thousands of years ago. 15. You’ll be eating spaghetti alla carbonara how it’s MEANT to be served. 16. And if you get tired of that (you won’t) you’ll be able to eat bucatini all’amatriciana, which you’ll be dreaming about for the rest of your life. 17. Also, visiting Castel Sant’Angelo will make you feel like you are starring in Angels & Demons. 18. Because Trastevere is the neighborhood that all other neighborhoods aspire to be. 20. … or a STRONG coffee drink from Sant’Eustachio il Caffe. Either way, you’ll never want Starbucks again. 21. Because thousands of years of history are around every corner when you stroll the Tiber. 22. And sneaking a #SistineChapelSelfie is probably the most thrilling experience of your life. 23. Though it’s crowded, channeling your inner Audrey Hepburn on the Spanish Steps is absolutely a must. 24. And checking out the Pantheon is unlike ANYTHING you ever could do back home. 25. Really… there just isn’t enough space to appreciate all the architecture throughout the city. 26. So one final shoutout — to Piazza Navona — will have to do. 27. Because you can’t beat a late-night dinner with your friends. 28. Especially with several bottles of wine. So. Much. Wine. 29. Or discovering something new (that’s actually REALLY old) during a winding stroll through the streets of the city. Gelato in hand, of course. 30. And no WAY will you be able to experience views like this anywhere else back home. For instance, the view atop Gianicolo Hill. 31. And most important, Rome will capture your heart so completely, you’ll never want to leave.